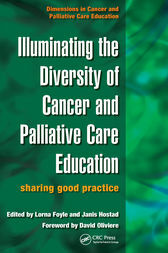 Illuminating the Diversity of Cancer and Palliative Care Education examines a myriad of original approaches, techniques, methods, educational strategies and imaginative innovations within this vital field of medicine. Its contributors share a range of educational techniques and tactics from Neuro-Linguistic Programming to creative teaching strategies for bereavement support, allowing readers to reflect on best practice and inventive ways of working which can be used or adapted to suit. This book is an ideal companion to its sister volumes Innovations in Cancer and Palliative Care Education and Delivering Cancer and Palliative Care Education.